ACM2B series of fan heatsink are designed to provide the thermal resistance from 1.3°C/W to 0.7°C/W. 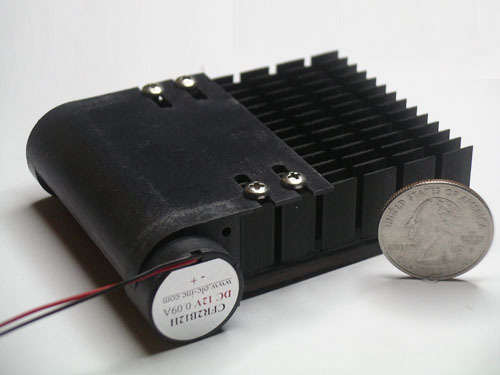 Each module uses one(CFR2B) of series of world's smallest cross flow fan to achieve linear airflow velocity above 2000ft/min through all fins of heatsink. ACM2B heatsink fan, thus, offers "true thermal resistance" to achieve the maximum efficiency of the forced air cooling and the lowest profile from 30mm down to 15mm. They are widely used in low profile and compact thermoelectric(peltier) cooling and electronics cooling. Click Profile2B.pdf for detail specifications. E-mail or call for your customized heat sinks. E-mail or call for prices of OEM quantities. Service: UPS FedEx DHL Acc No. and Service: ex. "123456789 Overnight"